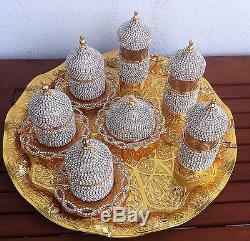 For all swarovski coated items. 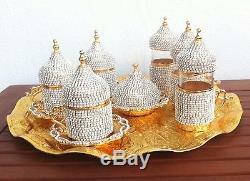 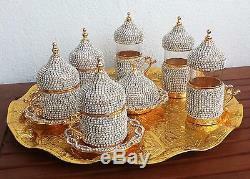 TURKISH COFFEE SERVING SET Made in Turkey Labor-Intensive production Semi Precious Stones Coated on Copper and Zamac Material GOLD color (or Glorry Silver) Contents: 3 x Coffee cups, saucers, lids and porcelain inserts.. 3 x Water-Tea cups, lids and glass inserts. 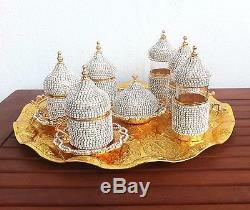 1 x Delight Bowl, dome shape, it has one saucer and one Lid. 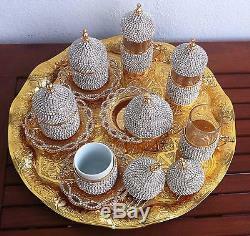 1x Tray: 35 cm diameter, round shape and wavy style The stones are. 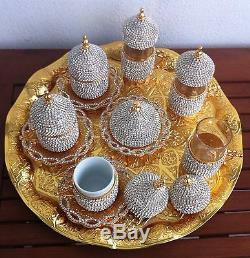 The photos show the actual item. 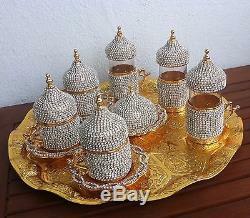 The item "24 Pc Turkish Arabic-Coffee-Espresso-Water Tea Cup-Saucer Swarovski Set -GOLD" is in sale since Monday, October 24, 2016.